The laptop project will sell the rugged little computers to U.S. residents and Canadians for $400 (284.72 EUR) each, with the profit going toward a machine for a poor country. The One Laptop Per Child project expects that its "Give One, Get One" promotion will result in a pool of thousands of donated laptops that will stimulate demand in countries hesitant to join the program. It will be offered for only two weeks in November. Originally conceived as the "$100 (71.18 EUR) laptop," the funky green-and-white low-power "XO" computers now cost $188 (133.82 EUR). The laptops' manufacturer, Quanta Computer Inc., is beginning mass production next month, but with far fewer than the 3 million orders One Laptop Per Child director Nicholas Negroponte had said he was waiting for. By opening sales to people in the U.S. and Canada at http://www.xogiving.com, "Give One, Get One" will delight computing aficionados, because the XO is unlike any other laptop. It has a homegrown user interface designed for children, boasts built-in wireless networking, uses very little power and can be recharged by hand with a pulley or a crank. Its display has separate indoor and outdoor settings so it can be read in full sunlight, something even expensive laptops lack. The machines use the Linux open-source system and do not run Windows; Negroponte expects that to be possible soon, but Microsoft Corp. insists it cannot guarantee that, given the machine's idiosyncratic specs. The catch is that "Give One, Get One" will run only from Nov. 12 to Nov. 26. Negroponte said the limited availability is partly necessary so the nonprofit doesn't run afoul of tax laws, but mainly designed to create scarcity-induced excitement. "We need that burst," he said. Then again, most buyers figure to be motivated more by the "Give One" aspect than the "Get One" part. Negroponte said that dynamic is beginning to pervade the program, with several poor countries finding that richer governments are willing to act as sponsors. For example, Italy is buying all 50,000 XOs that Ethiopia will get in the program's first wave. Now Negroponte is trying to encourage similar arrangements with governments in Europe and Asia, with Pakistan and Afghanistan among the possible recipients. Megabillionaire Carlos Slim is expected to purchase 25,000 XOs and lend them to Mexican children. Thailand, Uruguay, Nigeria, Brazil, Libya and Rwanda are among the countries that could be in the first wave of laptop customers, though specifics have not been announced. Given all the innovations in the XO and the discussions it has inspired about computers in education, One Laptop Per Child - a spinoff from the Massachusetts Institute of Technology - can claim significant achievements. However, Negroponte hoped to be further along by now. In September 2005, he was saying that 5 million to 15 million machines might be in production in 2006, with perhaps 100 million out by now. In April 2006 he foresaw 5 million to 10 million XOs dotting the landscape in 2007. Now 250,000 to 300,000 are due to be made by the end of this year. Negroponte expects that to ramp up to 1 million a month next year, though he still lacks signed orders for that many. One reason things may have gone slower than predicted is One Laptop Per Child's impending emergence awoke commercial vendors to the promise of a low-cost international educational market. Now governments considering buying XOs for their youngsters have multiple options in the $200 (142.36 EUR) range - including more-conventional computers that can run Windows. Negroponte acknowledges the absence of Windows led Russia to say no. One of the laptop program's unabashed admirers is Miguel Brechner, who runs a government-funded technology group in Uruguay. Brechner has been overseeing a test of 200 XOs in a Uruguayan village and believes the laptops have stimulated collaboration and raised expectations for children. He expects to buy many more XOs as Uruguay soon begins to outfit all 400,000 of its primary schoolchildren with laptops. "I'm absolutely a believer that this will change the country," Brechner said. But not all of those computers will be XOs. 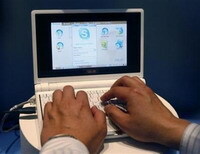 To hedge its bets, Uruguay probably will buy other inexpensive laptops as well, including Intel Corp.'s Classmate PCs. Brechner argues that Windows is a better option for older kids who are closer to entering the computing work force. "We will see (what happens) in the field and change whatever is necessary," Brechner said. "We will make some mistakes. We don't know who to copy on this."